An Afghan interpreter for the United States military who had been waiting for over four years on the U.S. visa list was tortured and killed by insurgents earlier this year, raising concerns that other translators could meet a similar fate as American forces withdraw from Afghanistan. Sakhidad Afghan worked as a translator for the U.S. Marines and Air Force since around 2008. Four years ago, he applied for a U.S. visa under a program for at-risk military translators. He was still on the waiting list when the Taliban reportedly kidnapped him from a bazaar this spring and executed him in the back of a trailer truck. Each year, thousands of Afghan interpreters under threat from anti-American militants sit in bureaucratic limbo, waiting for visas they were promised by the U.S. military. Advocacy groups said it is unlikely Sakhidad Afghan was the first translator killed while on the list, although the deaths are often difficult to confirm. According to Arif Rahmani, a member of the Afghanistan Parliament who spoke with Afghan’s family and the ANA brigade in Farah, the Taliban had been tracking Afghan because of his work with the U.S. military. "According to [the ANA’s] information, the Taliban captured Sakhidad from a bazaar in Farah," Rahmani wrote in a post [Warning: post contains graphic images] on his Facebook page. "From a trailer truck they tortured for awhile, then killed him. He introduced himself as Abdul Hamid, but that couldn't save his life." Afghan was between jobs after his base in Helmand closed in late 2014. In January he set off for Herat, a city in western Afghanistan, his brother told Rahmani. The Afghan National Army recovered his body in the beginning of March in the Farah river region, between Helmand and Herat, according to Rahmani. News of the murder swept through the Afghan interpreter community, where many are increasingly concerned about retribution attacks from the Taliban. "Taliban killed Afghan by chasing him. I am sure they are tracking me too and they will kill me also one day," said a translator who worked with Afghan and has also been waiting for a U.S. visa since 2011. His name is being withheld. Advocacy groups said the U.S. government often lets interpreter visa applications idle for years without telling applicants why. The State Department and other agencies recently instituted reforms to the Special Immigrant Visa process, and the number of visa applications approved in 2014 was significantly higher than prior years. However, the Iraqi Refugee Assistance Project, a group that advocates for Afghan and Iraqi linguists, said Afghan's death shows the risk translators face when their applications stall. "This horrifying incident is unfortunately just one example of how each passing day is another mortal threat to our Iraqi and Afghan allies," said Katherine Reisner, national policy director at IRAP. "It shows our veterans' dedication to their allies overseas, and how much hope they place in the SIV program," she added. "We fail our veterans when the SIV program fails. And it is a call to action for the Departments of State and Homeland Security to act justly and expeditiously on all SIV applications." The State Department declined to comment, saying it could not discuss details of individual cases. Afghan was Hazara, a Persian-speaking ethnic minority that has been targeted in a string of recent attacks. In late February, extremists kidnapped 31 men, mainly Hazara, from a bus returning from Iran. Some of the hostages were reportedly released in a prisoner swap earlier this month. Last month, the Taliban reportedly beheaded four Hazara in the Ghazni Province. Afghan did not have a birth certificate, but friends said he was around 26 years old. 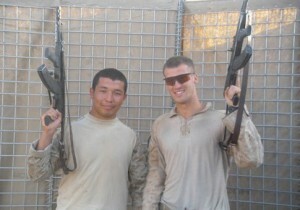 When he worked on a base in Marjah in 2010, he told some of the Americans he worked with that he wanted to become a Marine. They encouraged him to start lifting weights, which he began doing regularly. Washington Free Beacon managing editor Aaron MacLean, a former Marine officer who led a platoon in Marjah in 2010, worked with Afghan when the interpreter was assigned to his rifle company. "I just remember him being a good young man who did his job well, was as brave as any Marine, and came under fire as much as any Marine in Marjah," said MacLean. Afghan went on to work with the Air Force, but would still wear old Marine uniform pieces he saved from his previous assignment. He became a devoted runner, and entered the Marine Corps Marathon at Camp Leatherneck in 2011, finishing the race in just under 4 hours and 50 minutes. He also kept in touch with American service members he worked with after they returned to the U.S.
"I am deeply afraid of the current situation," Afghan emailed to one U.S. military friend on July 9, 2014. "If I go to the U.S.A I think I will be safe. Right now it looks like, the disaster is coming in the country." "I was always loyal to U.S.A and never betray its mission," he added. "I am absolutely sure that I have deserved an approved visa for United States." Even as years passed without receiving an answer on his visa, Afghan held onto hope. "Every rock strikes the feet of disabled goat. The poor gets poor, and the rich gets rich," he wrote the friend on July 10, 2014. "But I can see my future is bright."